Mohamed Salah found himself on the scoresheet for Liverpool yet again this afternoon, as the Egyptian superstar handed the Reds a 3-0 lead against Bournemouth. Salah has seemingly managed to keep up the form he displayed for the Merseyside club last season, as the former Chelsea man has now scored 20 goals in all competitions this year following his strike against the Cherries. 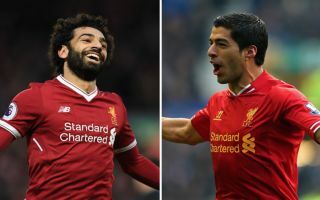 Having also managed to get 20+ goals in all competitions last season as well, Salah has now become the first Liverpool player since the world class Luis Suarez to score 20 or more goals in all competitions in consecutive seasons. Suarez became somewhat of a club legend at Anfield despite only playing for the Reds for a handful of seasons, a feat Salah looks like he’s well on the way to achieving given how he’s performed for the Merseyside club thus far. The 26-year-old has been Liverpool’s main man ever since the start of last season, and should he carry on with the way he’s currently going, it may not be long before the forward is held in higher regard than Suarez amongst Liverpool fans. Salah has now managed 17 goals in the Premier League for Liverpool this term, and it looks like the winger could be on his way to bagging a second consecutive Premier League Golden Boot should he keep up his current form until the last few games of the season.